Jackson Hole has officially entered the season of sun and snowmelt. Tourists are making their way through town to and from the parks, and the bustle around downtown Jackson has gotten exponentially louder. But step outside of downtown to the National Elk Refuge, a Cache Creek trailhead or even your own backyard, and you notice that human sounds aren’t the only noises that get louder this time of year. Choruses of birds at dawn, trills of surprised ground squirrels in the afternoons and the croaks of frogs in the evening remind us that this is quite the time to be alive in the mountains. These symphonies are enjoyable and relaxing to say the least, but they can also be valuable identification tools for Nature Mappers! Learning to ID bird songs, frog calls and even mammal sounds opens your range of observation drastically. Boreal Chorus frogs may be experts at wetland camouflage, and can even avoid our eyes when we’re right on top of them, but learn to recognize their calls and those hidden creatures become as obvious as a moose in the sagebrush. And what better time to start than the summertime! Many species are the most vocal during this time of year, and a walk down your street in the early morning or in the evening can be a great place to begin soaking in those summer sounds. Attached below are some excellent resources for learning amphibian and bird songs in particular. Our Nature Mapping database has been especially lacking in amphibian observations, and we know they are out there! Identifying wildlife by ear is a valuable skill, and practice makes perfect. The more practice you put in, the more species you can confidently Nature Map this summer! Small Mammals: What Good Are They? Small mammals serve as prey for our large mammals and raptors and provide other ecological services, such as aeration and recycling of soil and nutrients. Beaver, our largest rodents, form habitat for many other creatures, although they are a nuisance to homeowners with ponds and aspen plantings. Uinta ground squirrels are common in sage and grassland habitats, and they find similar features in lawns. They dig tunnels and form sleeping chambers, thereby creating holes and mounds, much to the consternation of homeowners and ranchers. I have nature mapped dozens and dozens of ground squirrels driving out the National Elk Refuge road in spring. Indeed they emerge and mate in April and each pair can produce four to seven young by May, which then scamper about every which-way eating grasses and flowers. Their abundance can seem overwhelming, even repulsive. Driving out this same route a day in mid-June, I spied several red-tailed hawks, Swainson’s hawks and even golden eagles soaring overhead and a coyote or two trotting through the fields, ears alert. The high-pitched alarm calls of ground squirrels came from all directions. I realized the abundance of raptors was due to the plentitude of squirrels. Uinta ground squirrels are tasty packets of protein. They are a necessary and timely food source for raising young raptor chicks, red fox kits and coyote pups. And the time is short… Uinta ground squirrels are above ground only three months before they go dormant in August for the next nine months. Many don’t make it. Other raptors, including northern harriers, prairie falcons and American kestrels, hunt open areas for rodents in sizes appropriate to their body weight. In addition to Uinta ground squirrels, least chipmunks, meadow voles and deer mice are important components of their diets. In old growth forests, red-backed voles nourish northern goshawks and pine martens. Great horned owls also devour small mammals. Fortunately, most small rodents don’t bother us humans. Another annoyance in cultivated areas is northern pocket gopher. As snow melts, one can see the extensive “eskers” that mark the pocket gophers’ progress underground eating roots, rhizomes and tubers for food. In summer, occasional fresh mounds of soil indicate areas of activity. Rarely does one see a whiskered grey face, with tiny eyes and ears, emerge from a hole. Bear, fox and coyote use their ears to find this plump fossorial (digging) prey. The Teton Raptor Center is monitoring pocket gophers as part of their population studies of the majestic great gray owl. Great gray owls can hear pocket gophers moving under feet of snow and plunge feet first to catch their vital winter meal. In addition, pocket gophers are particularly important in enhancing soils in mountain meadows. Their prodigious earth movement churns up nutrients, allows water and air to seep into hard-packed soils and provides opportunities for seed germination. Young beaver move up creeks and irrigation ditches to find new territory to raise a family. The sound of running water and presence of willows and aspen stimulates dam building. Some of these appealing sites are now landscaped into ponds surrounded by aspen trees. Beaver build dams to impound water to serve as moats and insulation for their lodges, where they raise their young and keep safe. Anyone who has visited Schwabacher’s Landing or Moose-Wilson Road in the park has witnessed the diversity sustained by these industrious rodents. Beaver impoundments encourage willows, sedges and aquatics, which in turn provide food and shelter for ducks, sora, amphibians and moose. The U.S. Forest Service and other groups are moving trapped beavers up drainages to enhance wildlife habitat and also to help with flood control and water quality. While beaver can be pesky in our expanding human habitats, they are much needed in our natural habitats. Even the most lowly, annoying-to-us critter has a role to play in our ecosystem. While no one wants wildlife in our homes, understanding the importance of each species in Jackson Hole can enhance our enjoyment of the out-of-doors, even in our own backyard. Uinta ground squirrels are buffy brown, about a foot long, with short tails. They often sit erect near the entrance to their burrow holes or look like soft lumps of manure on the edge of roads, until they move. We particularly encourage notations on the First of Year (FOY) appearances in March and April and Last of Year (LOY) sightings in late July and early August. Our other ground squirrel, Golden-mantled ground squirrel, looks like a chipmunk due to two set of stripes on its back, but unlike chipmunks, it does not have stripes on its head or tail. These are mostly found in forests, rocky areas and some shrubby sites, particularly at higher elevations. We have three species of chipmunks: all have stripes on their heads, backs, and to some extent down their tails. Least chipmunk is more likely in the sage flats and runs with its tail straight up. The tail is longer than its body. It is smaller and darker on its belly than the Uinta chipmunk, which is found more in coniferous forests or shrubby areas. Uinta chipmunk tends to have a lighter belly and a wider tail. 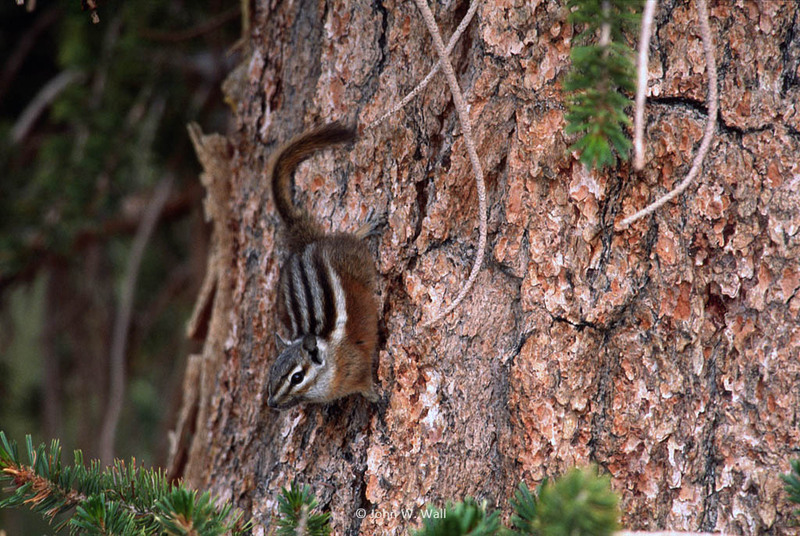 Unlike the other two species found in Jackson Hole, Uinta chipmunks have a white outermost stripe along their backs (rather than a fairly distinct black or blackish-brown stripe), which is shown nicely in this Berkeley photo. Relatively more brightly colored, yellow pine chipmunk is also a forest species and has orange highlights. These can be very difficult to distinguish. Do your best, but when in doubt leave it out. Three Chipmunks in Jackson Hole: Least (left), Uinta (middle) and Yellow Pine (right). Middle and right photos Wyoming Game & Fish Department (WGFD). Northern pocket gophers by their nature are hard to see unless you are lucky. These gray, 8 inch animals have small eyes, tiny ears, and large front feet with noticeable claws. Their tunnels are obvious either as 3-4 inch rounded eskers left over from winter foraging or fresh mounds of soil about a foot wide and several inches high in summer. This “sign” can be used to indicate areas of abundance in sage flats, meadows or forest openings. Mice, voles, and shrews are impossible to identify to species; therefore, we encourage nature mappers do their best record the groups. Mice have big ears and long tails. Voles have smaller ears and shorter tails and look relatively compact compared to mice. Shrews, which are a separate family, have elongate pointed heads with small eyes and ears and many teeth to eat their prey of insects, earthworms and the like. Tails vary in length. Our common species is masked shrew. We do not have moles in Jackson Hole. Mouse (left), Vole (middle), and Shrew (right). Beaver can be distinguished from their relative muskrat by their flat vs. rat-like tails seen while swimming in water. While both have rich brown pelts, beaver are usually bigger with a flatter head and are found among willows or other woody plants, which they use for food and dam building. Muskrats use soft-stemmed cattails, reeds and rushes to form their mounds and for food; therefore, they are more likely in wet meadows and marshes. Beaver (left) has a flat tail while its relative, the Muskrat (right), has a rat-like tail. Red Squirrels: Many people recognize the wide-eyed, bushy-tailed red squirrel found in forests and porches. Often we hear their chatter in the deeper forest. These tree squirrels are defending their territories and particularly their caches of cones. If you happen to see an active “midden,” pile of cone scales and stalks, take a point. This is an indicator of highly productive trees and possible pine marten habitat. This past Saturday, May 19, 2018, JHWF staff participated in the annual Wyoming Game & Fish Department bird survey of the South Park Wildlife Habitat Management Area, just south of Jackson. Our group of volunteer birders, including enthusiastic Nature Mappers and Jackson Hole Bird & Nature Club members, met bright and early Saturday morning, led by our local bird nerd expert volunteer, Tim Griffith. Tim has been crucial to organizing Game & Fish bird surveys of the South Park area since 2016, which have so far logged 96 different species for the area! Our pack split into two groups, one to tackle waterfowl, shorebirds and raptors around the ponds, the other to take on “Warbler Alley,” the thick cottonwood tree groves hugging the backwaters of the Snake River to the southeast. What an appropriate nickname that was – Yellow Warblers dotted most every tree in South Park, and were joined by the radiant Yellow-rumped, Wilson’s and MacGillivary’s Warblers as well. It was a different traveler from the south, however, that took everyone by surprise. ‘Warbler’s neck’ is a common occurrence on a bird survey. After a busy four hours of hiking and birding the survey was winding down, and brunch was on the brain. But birding tends to deliver the bombshells at the last moments, and Saturday was no different. Jon Mobeck, our team’s oriole-obsessed leader shouted. “Bullock’s! Wait… BALTIMORE!” In a low hawthorn tree not 50 feet from us, was not only a Bullock’s Oriole, a gorgeous but fairly common bird in Jackson Hole, but next to it was a Baltimore Oriole, a normally much more eastern cousin. Historical records vary, but this bird may be one of less than a dozen ever reported in the state of Wyoming, and likely less than a handful have ever been seen in Teton County. What a find! The Bullock’s and Baltimore seemed to follow each other, flying from tree to tree after one another. Perhaps the Baltimore had lost his way on his normal spring route up from Central America, noticed a bird that resembled his brilliant orange color, and followed that Bullock’s back to our western mountains, far away from his normal east-of-the-plains summer vacation. It’s moments like these that make us realize how special close-to-home wild places like South Park are. The diversity of wildlife in these areas can be astounding. But problems exist in the fact that unless these places are studied or surveyed, we may never know the rarities or struggling populations there. This is the issue Nature Mapping Jackson Hole is helping to solve – by submitting data from your commute from work, a dog-walk in a Jackson city park or a backpacking trip through the Gros Ventre, you are helping to build our human community’s understanding of the wildlife community that surrounds us. And every data point really is significant! You don’t often find rare birds like the Baltimore Oriole, but it’s very possible that the deer you saw driving home could represent the beginning of a muley movement exploring a new feeding ground in Jackson Hole. The data you enter from these sightings help JHWF’s partners to prepare management decisions that inspire positive interaction between humans and the wildlife moving into these areas. Knowing that your effort can directly benefit our local species is a reward in itself, and who knows – maybe your attention to wildlife developed from Nature Mapping will lead you to that once-in-a-lifetime animal. Max Frankenberry spots a Common Merganser on a back channel of the Snake River through Wingspan Optics binoculars. Three mule deer does and a fawn spotted on the Sept. 10, 2017 float trip. Photo credit: Forest Dramis. As we flow downstream, we scan the shorelines, water and sky, and settle into intervals of excitement and tranquility. A designated Nature Mapper jots down the tally for common species and takes GPS points for unusual sightings. A morning’s count can include eight Bald Eagles, a moose, numerous Spotted Sandpipers, Common Mergansers, Yellow Warblers, nesting Bank Swallows and a flotilla of American White Pelicans. Or perhaps we spy a marmot family basking on a rock, or a beaver up a backwater. For seven years, Nature Mappers have been gathering data on wildlife thanks to A.J. DeRosa, owner of Jackson Hole Vintage Adventures. A.J. donates his handcrafted wooden dory and an expert boatman every Sunday morning from May to October. With this opportunity for consistent data collection, Nature Mappers have been able to record trends and shifts in species’ numbers and locations over the summer months (May-October), year to year. We are beginning to discern patterns in species’ migrations, nesting locations, and possibly, with time, impacts of flooding, dike vegetation management and river use. These results are possible thanks to over four-dozen trained nature mappers and friends participating each year. Ace volunteer Tim Griffith schedules the teams and often adds his expertise on the floats. Since Tim started coordinating the trips with A.J., many species’ sightings have increased significantly. Tim has a fine ear and eye for the birds! Please read Tim’s 2017 Nature Mapping Jackson Hole Snake River Float Trip Annual Report here. It includes a species list and numbers; the special conditions of 2017 during the spring flood and its effect; and the season’s variation in eagle numbers. Be sure to contact Tim if you wish to volunteer on a Snake River Float Trip this summer! On Sunday, May 6, I had the privilege of participating in my first Nature Mapping Snake River float trip. And what a trip it was! Along with fellow “bird nerds” Jon Mobeck and Tim Griffith (trip leader/coordinator) and guide Adam “Dutch” Gottschling, I spent two hours of the morning floating the eight-mile stretch of the Snake River between the Wilson bridge and Jackson Hole Vintage Adventure’s Tipi Camp. Having recently moved to Jackson from the relatively flat plains and forests of the upper Midwest, I have a long way to go before I look up at the grandeur of the Tetons with anything but complete and utter awe. So, had we merely floated for two hours looking only at the river and surrounding mountains, without seeing any wildlife, I personally would have considered my Sunday morning well spent. Highlights included 54 American White Pelicans (the largest number ever recorded on one trip), one Swainson’s Hawk, one Merlin, a Greater Yellowlegs and two moose. Though, based on the excitement in the boat, to call the Merlin and Greater Yellowlegs mere highlights is a gross understatement. For good reason too! It turns out only a handful of each species have been spotted by volunteer citizen scientists since the trips began in 2010. I’d like to say it was beginner’s luck, but I’ve spent enough time appreciating the wild spectacle that is nature to know that to try to claim any credit is silly at best. Besides, who knows what will be seen throughout the rest of this summer? Either way, this trip was an awesome start to what is sure to be an amazing float trip season. Even without such a notable species list, I feel lucky to have been a part of such an experience—to have spent the morning exploring an area of nature that few have the chance to see in a way that even fewer are able to see it. JHWF partners with AJ DeRosa’s Jackson Hole Vintage Adventures to provide this incredible opportunity to float down the eight-mile stretch of the Snake River between Wilson Bridge and South Park and to collect important data about the various species of mammals, birds and amphibians that use it. Trips take place every Sunday morning from May 6, 2018 through the end of September. Cost is $30 per participant. To learn more, visit the Snake River Float Trip webpage or call the office at 307-739-0968. To sign up for an upcoming trip, contact project coordinator and expert birder Tim Griffith at timgrif396@gmail.com. Cyclists gather at Bradley-Taggart parking lot for leg two of the Mountain Bluebird Classic. Jackson Hole Cycling’s unique fundraiser on two wheels this past Saturday, April 28, 2018, brought in over $1,200 for Jackson Hole Wildlife Foundation’s (JHWF) Bluebird Nestbox Project. The “Mountain Bluebird Classic” is an annual spring group ride of the area’s road cyclists. Named for the mountain bluebirds who are busy building nests in cavities during the spring, the cyclists meet at the Home Ranch Visitor Center and ride to the Bradley-Taggart Lake parking lot to meet others who want to ride a shorter 30-mile version of the social ride (from Bradley-Taggart parking lot to Signal Mountain and back). This year, the National Elk Refuge (NER) was able to open the north pathway early so the cyclists braving the longer 70-mile version of the road ride were able to see many of the nest boxes along the NER’s western border that JHWF installed and have been monitoring since 2003. Last year, Jackson Hole Cycling’s executive director, Forest Dramis, asked participants to make donations for JHWF’s Nature Mapping Jackson Hole project, which recently added mountain bluebird banding and resighting to its conservation and research efforts. The 2017 ride brought in almost $300 while the 2018 ride raised over $1,200, so far. JH Cycling matched the riders’ donations this year. Approximately 60 riders took part in this year’s event, which featured “bluebird” skies and unseasonably warm temperatures in the mid-60’s. Two riders even came from out of town for the scenic ride. One cyclist who did the ride last year came back all the way from Minneapolis, Minnesota to tackle the challenging social ride in Grand Teton National Park (GTNP). Another traveled from California to ride with her nephew. Cyclists regroup at the base of Signal Mountain during the Mountain Bluebird Classic. The Mountain Bluebird Classic was envisioned eight years ago by avid cyclist and science educator Aaron Nydam who wanted to create an event that captures the spirit of cycling and is inclusive to most all levels. Approximately 60 cyclists participated in the 2018 Mountain Bluebird Classic.